Are you ready to spend your time on the weekends doing something other than taking care of your lawn? Southwest Greens of San Diego has the perfect product for you! Our synthetic turf and grass are of the highest quality, long lasting and virtually maintenance free. With our grass products we can design your own golf green, play area, enhance your backyard landscape, and save you valuable time and money by cutting out the yard work and making “fun time” all of the time. Year round green grass and you’ll hardly be able to tell the difference between synthetic grass and the real thing! Little to no maintenance. No watering, mowing, fertilizer or dust. Just more time for you to relax! Build a true-to-size or miniature backyard putting green, or putting course, in your very own backyard. Our putting greens are a great addition to any residential home or commercial area and it will take your golf game to new heights! Southwest Greens ‘ synthetic grasses are designed to last through seasonal changes. You won’t have to worry about your surface holding water during the rainy season, or will you need to worry about it fading or browning during the hot and dry season. To get started, simply call Southwest Greens of San Diego at 619-582-1030, and we’ll help you decide on a custom design along with one of our many varieties of synthetic turf. Then, sit back and let us do the construction and installation. It’s that easy! In just a few weeks, you could have artificial grass that stays green year round and requires little maintenance. 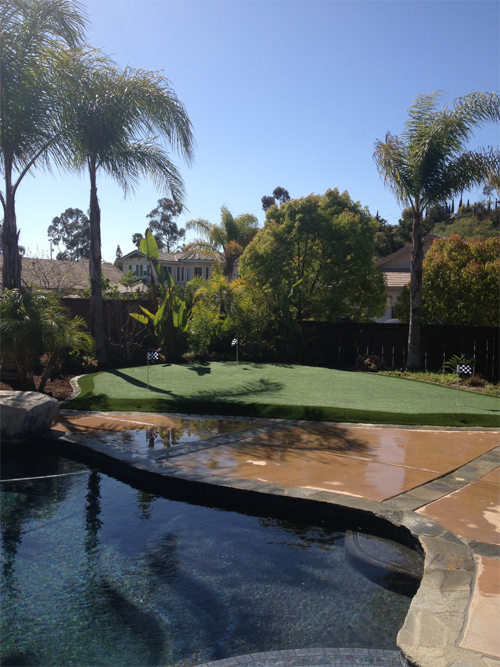 Southwest Greens of San Diego turf and grass products can go indoors or outdoors to enhance any area. Our team of experts has installed our greens for golf courses, homes, office complexes, retirement facilities, college campuses and more. Why not trust the experts for your commercial or residential project. Call us today at 619-582-1030 and start saving money on lawn upkeep in just a few short weeks!